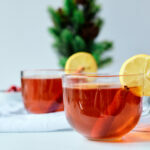 Warm up with this bourbon hot toddy. The lemon and honey combination is also perfect for fending off a cold or flu. Pour bourbon into a heatproof container. Add honey, lemon juice and grated nutmeg. Pour boiling water into the container. Distribute among two large mugs. Add a twist of lemon or orange peel and a cinnamon stick to each mug. If you don't have fresh nutmeg, just substitute dried nutmeg. A bourbon or rye whiskey is a good substitute for honey bourbon liqueur...just add more honey to taste.